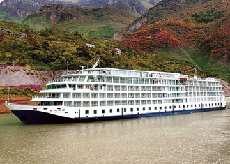 Cruise the Yangtze River on Viking Emerald, a beautiful, state-of-the-art river cruise vessel. Accommodating 256 guests with full verandas, hotel-style beds in every spacious suite and stateroom and an outstanding crew, Viking Emerald is one of the most sophisticated river ships in the world. The ship's hotel operations are 100% managed by Viking River Cruises Swiss-trained management team, employing the best and most knowledgeable English-speaking staff. Enjoy one of the Viking Emerald's roomy 250-square-foot staterooms, or treat yourself to a Suite or Junior Suite. Or perhaps you would enjoy one of the two 603-square-foot Explorer Suites, with a separate sitting room and private wraparound veranda. The choice is yours! Condé Nast Traveler Readers' Poll "Top River Cruise Ship"